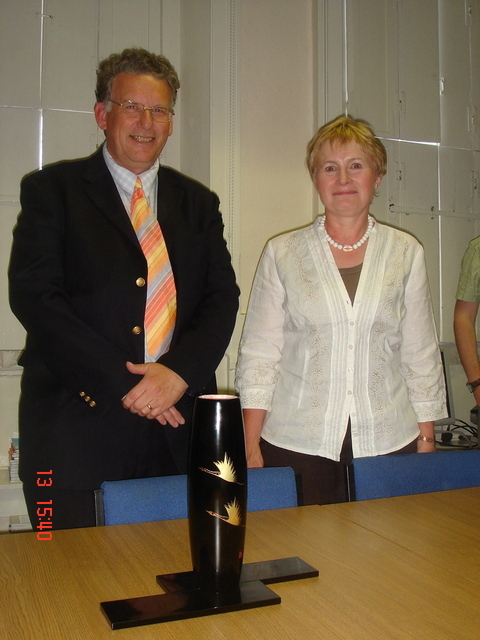 Sue Barnes retired on 13 June 2008 after nearly 30 years service with the IUCr. Known to many for her technical editing of Acta Crystallographica Section A and International Tables for Crystallography, Sue Lowe joined the Chester staff of the Union in 1978. Executive Secretary Mike Dacombe presents a gift from Professor Yuji Ohashi, IUCr President, to Technical Editor Sue Barnes on the occasion of her retirement. Managing Editor, Peter Strickland, presents flowers from the staff to Sue Barnes on the occasion of her retirement.